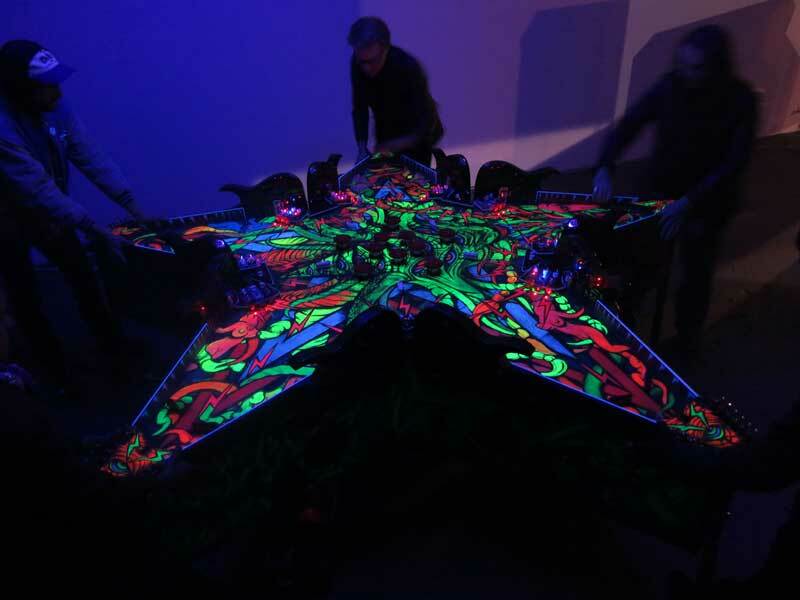 A pentagram shaped pinball game emblazoned with fluorescent graphics by the Rev Kriss Hades depicting the lord of the deep ones. 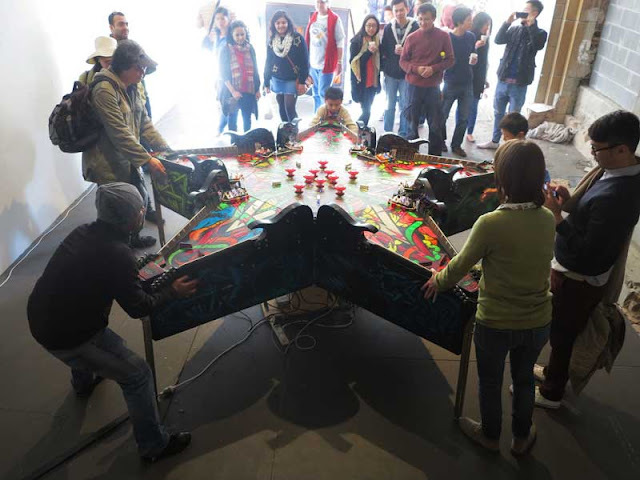 A multiplayer pinball game with five players stationed at each of the stars five points. 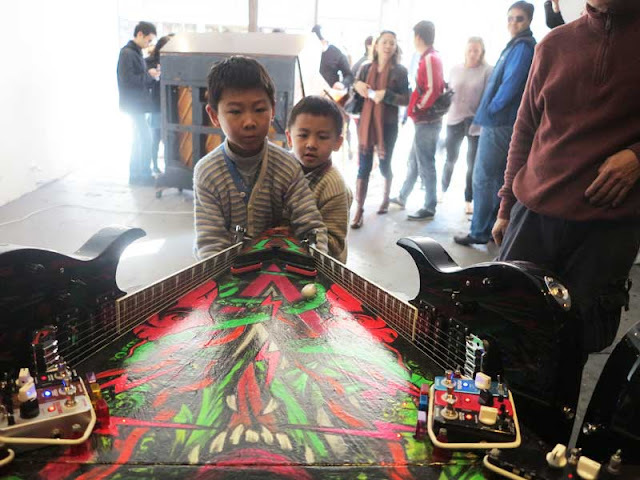 The outer triangular walls of the star are made from ten guitars with their fret boards facing inward into the playfield, while in the central pentagon ten pop bumpers are connected to a drum machine. These are all connected to various audio effects triggered by targets positioned throughout the game. So when the balls bounce off the strings distorted open tunings are produced while the pop bumpers accompany the din with a chaotic drum solo. 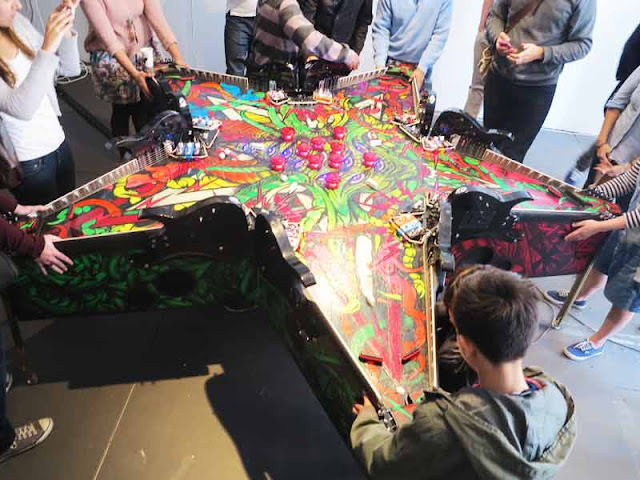 Abela’s hybrid, Balls for Cathulu (2013), combines pinball mechanisms with electric guitars. 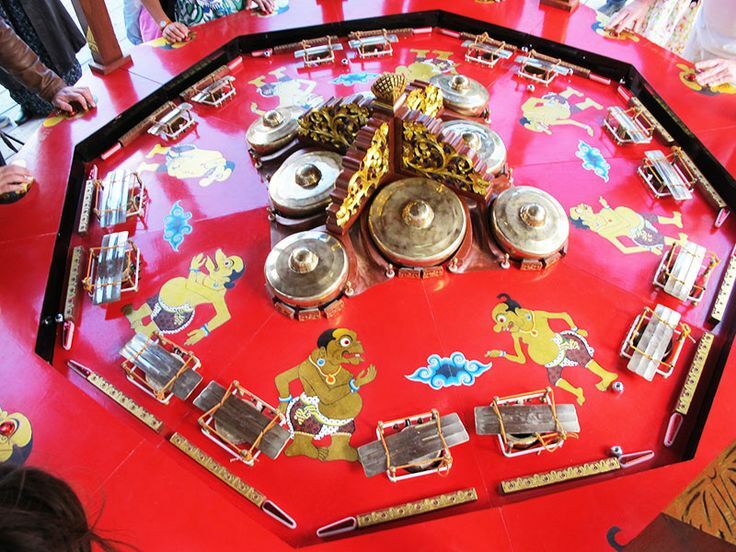 It’s a five-player game with the instruments arranged to create a pentagram (decorated by heavy metal master Reverend Kriss Hades). There is a basic level of feedback at all times but as you flick the balls around they hit the live strings of the guitars setting off new wailing tones. 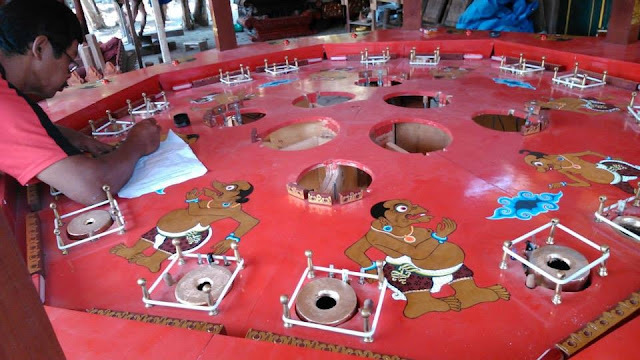 In the centre is a series of bumpers that play percussive sounds when impacted. 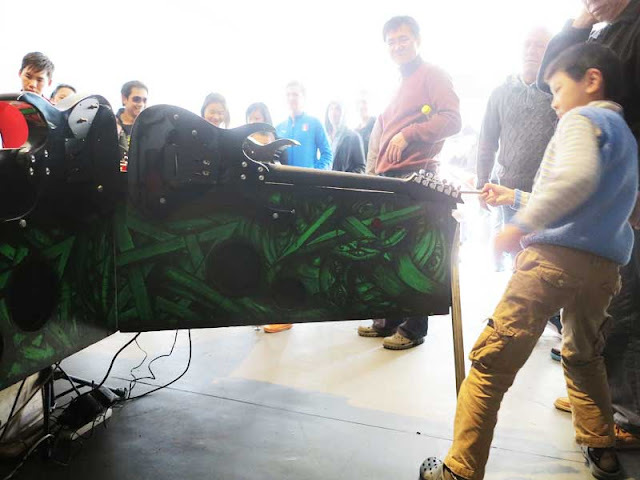 It’s loud, ingenious and unbelievably satisfying to play, the cause and effect a totally physically process. 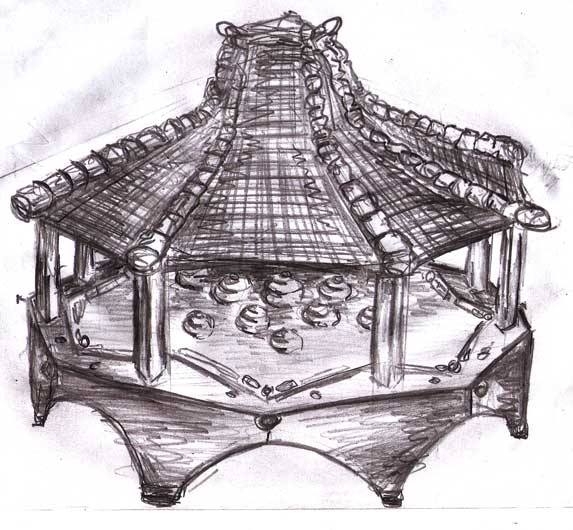 Plus you have permission to make a god-awful, yet aesthetically coherent racket! These creations, along with a previous work, Vinyl Rally (which I’ve yet to experience), prove Abela, already a renowned noise performer, to be a truly unique instrument builder and installation artist. To execute Gamelan Wizard Lucas Abela has teamed up with two of Yogyakarta’s most celebrated musicians Wukir Suryadi and Rully Shabara in addition to working with famed Gamelan master Wibowo who, along with his skilled craftspeople, hand carved the cabinet and forged the Gamelan. By pitting together our two disparate icons; Pinnies and Gamelan, we have created a unique participatory installation that meshes together our respective cultural identities.